We welcome you to use the following homily resources, written by Fr Michael Maginn, for the Christmas Vigil Mass, Midnight Mass and Dawn Mass. Not quite there. Not just yet. The presents are under the tree but still not opened. The turkey is ready for the oven but not yet for the table. The exhausted young couple have arrived in Bethlehem but the manger remains empty. We are still in Advent. Only just. We are still hoping, praying, expecting. What is it we are hoping for? Who are we praying for? What kind of Christmas are we looking forward to? Stay with the questions tonight. The answers may still not have crystallised in our minds and hearts. Stay with the questions; patience, patience, patience. The Lord is near. Everything will make sense in the end. Eventually, all our questions will be answered. Maybe not right now. Maybe not tonight. Tonight we continue to trust and to pray and to believe. Not knowing is hard. Uncertainty unnerves us. But now is the time for pondering, for contemplation and above all for trusting. Our prayer tonight is the prayer of St Julian of Norwich: all shall be well and all shall be well and all manner of thing shall be well. All the traditional elements of the Christmas story are provided by St Luke tonight. The arduous journey from Nazareth to Bethlehem: an opportunity to reflect on homecoming and to truly welcome our loved ones who have traveled home for Christmas. The birth of the Christmas child: an opportunity to pray for all babies born tonight in difficult and trying circumstances, babies born in war zones, bomb shelters, migrant camps, as well as those born in our own maternity wards. No room at the inn: an opportunity to welcome our foreign national friends and fellow parishioners and to acknowledge the gifts and added cultural richness they bring to our local parishes and communities. Welcome the stranger is not a gospel add-on but a gospel imperative. Shepherds watching their flocks by night: an opportunity to pray for night workers and for those who provide essential services, including tonight: police, fire, ambulance, etc. The message of the angels, ‘do not be afraid’: an opportunity to reflect on what frightens us, why we are frightened and how those fears might be addressed from a perspective of faith. The song of the angels giving glory to God: an opportunity to thank those who make music in our churches and to reflect on our need to sing and to pray, dropping our inhibitions, cutting ourselves free, letting our spirits truly soar to God. 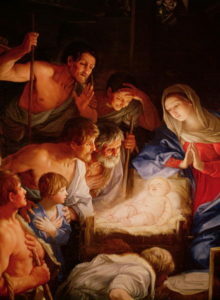 The Dawn Mass of Christmas is sometimes known as the Mass of the Shepherds. They were first to hear the news about the birth and the first to visit the child at Bethlehem. In that culture and time, shepherds were looked down on by the rest of society. Looking after animals was not the kind of reputable occupation most parents wanted for their children. Shepherds lived in rough shelters in the fields and hills and yet these rough characters, as we imagine most of them to have been, became the first to hear the gospel and to preach it. We suspect that Good Pope Francis might have a special place in his heart for the Christmas shepherds; at the Chrism Mass in a Rome last Holy Thursday, he suggested that priests today, and all those who preach the Gospel, cannot be true shepherds unless they are living with the smell of the sheep. An opportunity maybe for preachers to share something of our own faith and personal struggles and to invite people to pray for priests so that we may become year on year, more authentic bearers of the Good News. See: I Saw A Stable by Mary Coleridge.